What does it mean to major in forensic chemistry? Forensic chemists apply the principles and tools of chemistry to the analysis of evidence in criminal investigations. Our students focus on analytical chemistry and biochemistry/molecular biology, with a capstone internship experience and participation in research, experiences that are not common in other forensic science programs. Forensic chemistry majors develop strong problem-solving skills. Understanding evidence requires tools from many disciplines, including chemistry, biology, materials science, and genetics. Public speaking skills and scientific competence are important characteristics for this career as forensic chemists must often explain what was found and how they arrived at their conclusions. 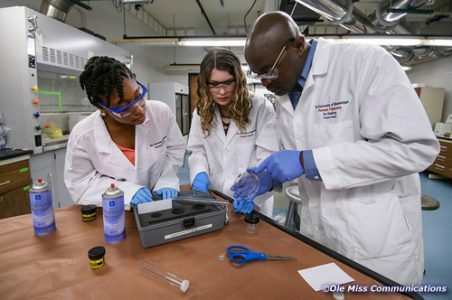 Why is the University of Mississippi a good place to study forensic chemistry? There are 26 faculty in the Department of Chemistry and Biochemistry with areas of expertise in analytical, biochemical, computational, electrochemical, environmental, forensic, inorganic, organic, physical, and theoretical chemistry. Ranked nationally, forensic chemistry is one of only a few chemistry programs accredited by the Forensic Education Programs Accreditation Committee. It is the only FEPAC accredited program in the country with both an internship and senior research requirement. The 10-week internship at a state or federal crime laboratory provides the student with a real-life crime laboratory atmosphere to decide if this is truly the desired career path one wishes to take. Internships also provides the crime laboratory with the opportunity to recruit the student for future crime laboratory employment. Students must also perform original research that must be presented to a minimum of three faculty members or presented at local, regional, or national conferences. 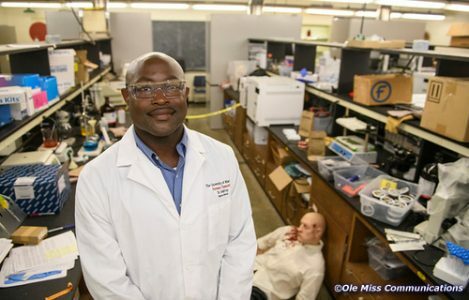 Dr. Murrell Godfrey, Associate Professor of Chemistry and Director of the Forensic Chemistry Program, earned his Ph.D. in chemistry from the University of Mississippi. His research interests include the detection and quantitation of cannabinoids in marijuana, the detection and quantitation of synthetic cannabinoids, the detection and quantitation of various illicit and prescription drugs in wastewater, the effects of marijuana on the renal and cardiovascular system, the detection of illicit drugs in fingerprints, the correlation of different strains of marijuana and THC content, the determination of the geographical origin of marijuana samples, mitochondrial DNA typing of ancient human remains, and computational methods to predict and characterize undetected fentanyl, kratom, and synthetic cannabinoids. Dr. Godfrey’s recent awards include the 2016 Black History Month Diversity Award for Excellence from the MS IHL Board of Trustees and the 2016 Kenneth S. Field Award of Appreciation for Outstanding Service to the American Academy of Forensic Science Staff. He also serves as a Commissioner for the Forensic Science Education Program Accreditation Commission (FEPAC) and the Vice-President and President-Elect of the National Organization for the Professional Advancement of Black Chemists and Chemical Engineers. What can forensic chemistry majors do after graduation? A liberal arts education empowers and prepares students to deal with complexity and change through a broad knowledge of the world. They gain key skills in communication, problem-solving, and working with a diverse group of people. Majors can gain employment in forensic chemistry labs associated with state or local police departments, the medical examiner’s office, forensic services lab, or the Federal Bureau of Investigation. There are also some private forensic labs. Caroline earned a scholarship to complete a three week UK study abroad program, CSI: Leicester, at the University of Leicester, known for the discovery of DNA fingerprinting in the 1980s. This study abroad program led her to return to Leicester to work with Dr. John Bond for an internship where they developed fingerprints on receipts, or thermal paper. This research was published in the Journal of Forensic Sciences. Caroline is currently earning her Ph.D. in Chemistry at UM. 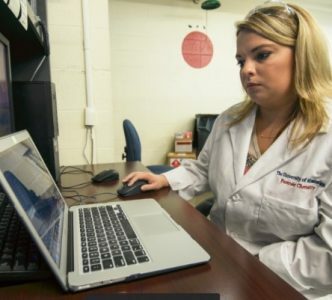 She has presented at conferences around the country on her forensic chemistry research, including DNA analysis, drug analysis and illicit drug studies using computational chemistry. She has traveled around the state to train with forensic scientists. Whom should I contact to learn more about majoring in forensic chemistry?